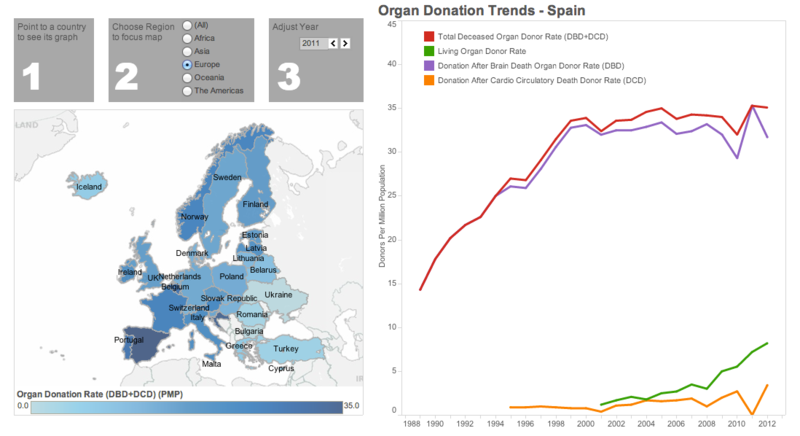 This interactive map and graph shows trends for deceased and living organ donation rates for most countries around the world. Deceased organ donations most frequently come from patients who have suffered injuries that lead to brain death such as traffic accidents and strokes. These types of donors are referred to as donation after brain death donors (DBD). In certain cases, deceased organ donations can also occur after cardio-circulatory death (DCD) where the donor has suffered cardiac arrest. While much less frequent than DBD, rates of DCD are increasing in some countries. The solid organs which can be donated by deceased donors are the heart, the liver, the pancreas, kidneys, the lungs and intestines. Adding together the DBD and DCD rates yields a country's total deceased organ donation rate. The solid organs that can be donated by living donors are most frequently kidneys though sometimes a living donor can donate part of her/his liver and in very rare cases part of her/his lung.